After graduating with a Fine Arts degree in 1977, Gregory Hull moved to Los Angeles hoping to interest an art gallery in his work. Oil paintings in hand, he went to Rodeo Drive in Beverly Hills and caught the break that would launch his career as a professional fine arts painter. Forty-one years later, Gregory’s celebrated oil paintings are on display at distinguished art galleries across the United States. 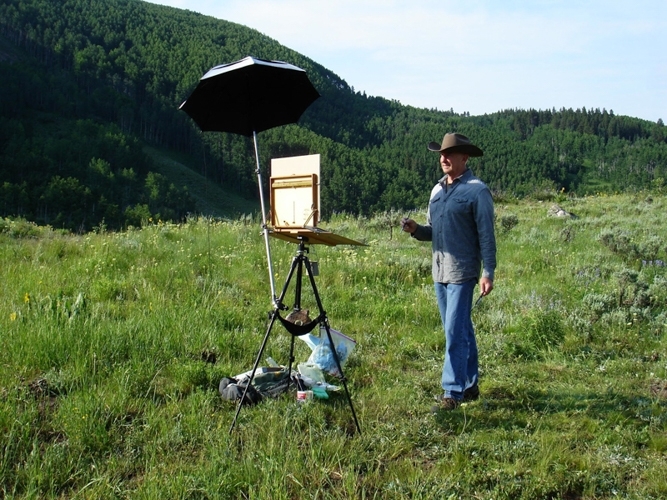 He’s been featured in over a dozen one man exhibitions and earned numerous awards from art competitions across the west. 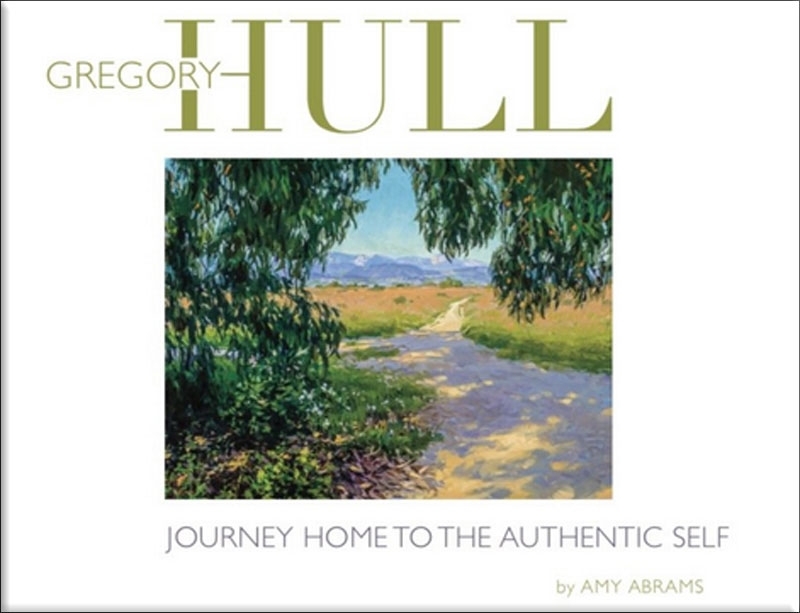 In 2017, Gregory’s career and work were featured in a hardcover book by Amy Abrams titled, “Gregory Hull: Journey Home to the Authentic Self”. Gregory also happens to be an avid truck camper. His Bigfoot 12C9.5 and 2017 Ford F350 function as his mobile painting studio. 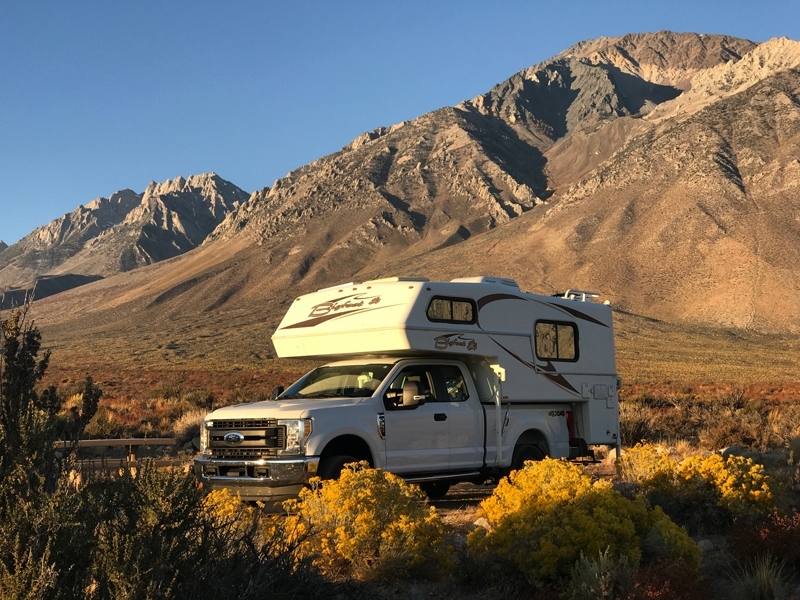 Fully self-contained with four-wheel drive, Gregory’s truck camper rig takes him where his creative juices flow, and keeps him comfortable. 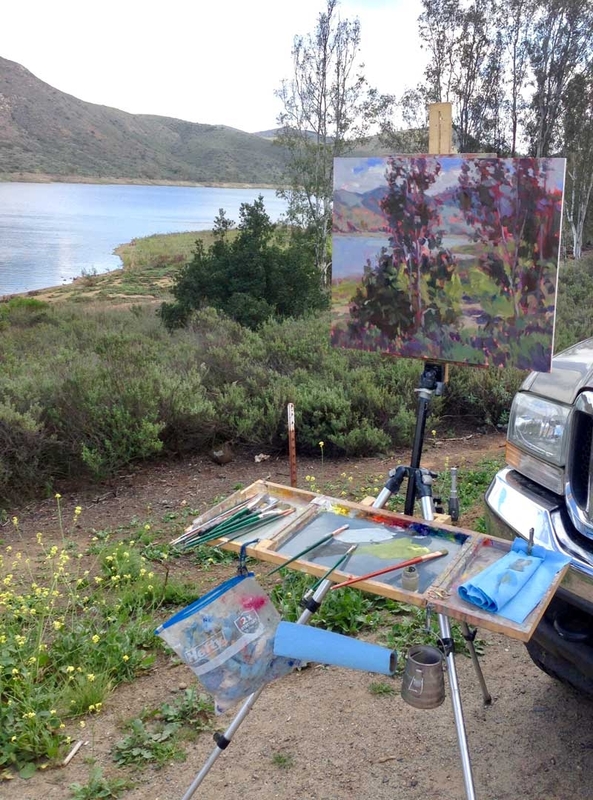 It’s not far fetched to state that Gregory’s truck and camper are as important to his fine art as his easel, brushes, and paint. TCM: Before we talk about your fine art career, tell us a little about how you got into truck camping. Gregory: My parents were campers. They started with an army surplus tent, graduated to a tent camper, and then a truck camper. I don’t know what brand it was, but it was made in the mid-1970s and had propane lanterns inside. As kids we would ride in the back and look out the front window tooling down the highway, which is now illegal. As I grew older, I went off on my own. My parents continued increasing the size of their rigs until they were in a gigantic Class A motorhome. I never liked the motorhomes as much as the truck camper. In 1996 an artist friend got me interested again in truck campers and I got a new Ford and a Lance Camper. We planned many painting trips together and we would meet up at different spots to inspire each other and work. TCM: Now that sounds like a good friend. How did you later decide on your current Bigfoot? Gregory: I’m 6’5” and the ceiling in my Lance Camper was too low. That camper had a basement, so it had a lower ceiling. I was bumping my head unless I took my shoes off. Then I learned that the Bigfoot 1500 Series does not have a basement. My Bigfoot is 81-inches to the ceiling. That’s over 6’7” of interior height. 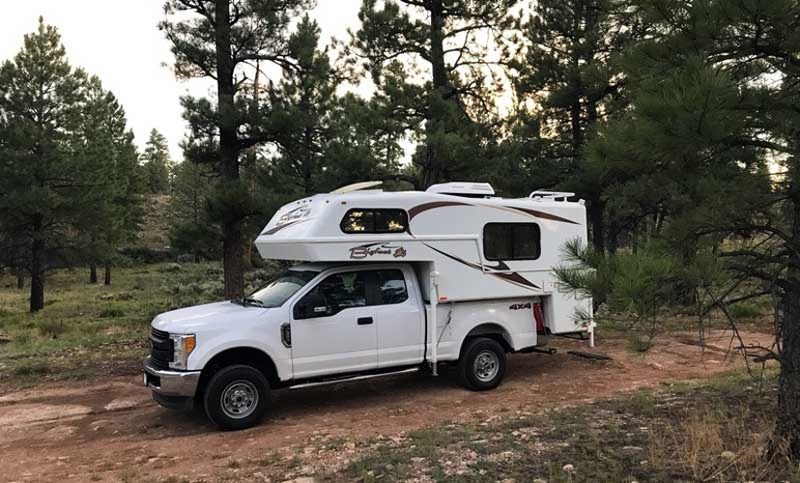 I got the Bigfoot 15C9.5 because I like short bed non-slide truck campers. I can just pull over anywhere to paint, nap, or eat. Then, I’m ready to go. I have all the luxuries of home in a small space. 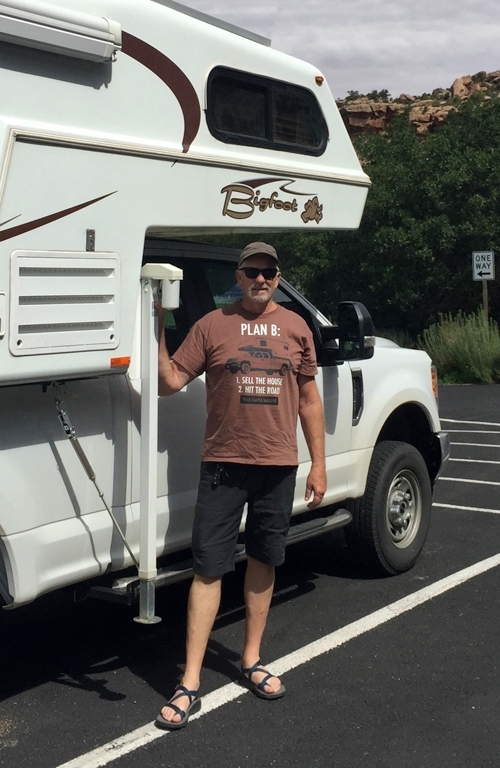 TCM: How does having a truck camper help you with your career as an artist? Gregory: The main thing is that I can get to a place and stay there until the light is gone. The late afternoon light is pleasing. I am not rushed to go home or go back to a motel room. 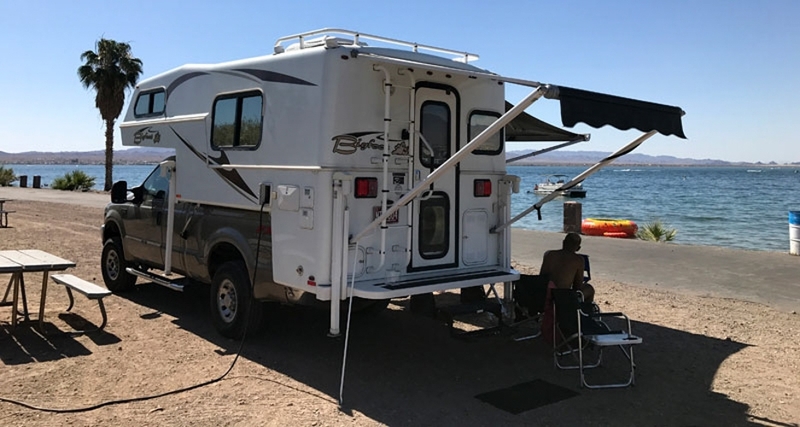 With my camper, I am living comfortably with everything I need. After I paint, I’m able to relax and have some wine, cook dinner, and go to bed. It’s nice. I’ve had a lot of those experiences traveling and boondocking on forest roads. It’s good to get away from hookups and other people. I can open the camper’s door and have a built-in painting scene. I’m right there. Before I had a truck camper, I would go backpacking and sleep in a tent. Now, I’m convinced that I need a heater, a bed, water heater, and a lovely kitchen. TCM: How did you get into professional painting? Gregory: I have been an oil painter since high school. Then, I got my degree at the University of Utah. I thought I would teach art. When I graduated in 1977, we moved to Los Angeles. I was able to move into a family member’s apartment and live cheaply. Then I hit the road with my portfolio. I went to some galleries on Rodeo Drive in Beverly Hills. One gallery owner was interested in my paintings, but couldn’t show my work because his gallery had a different emphasis. Fortunately, his brother was running Wally Findlay Galleries across the street and I signed a contract with him to paint still life paintings. After that I had my paintings in Chicago, New York, Palm Beach, and Beverly Hills. Plus, I did a couple shows a year. That went on for fifteen years. I was lucky. 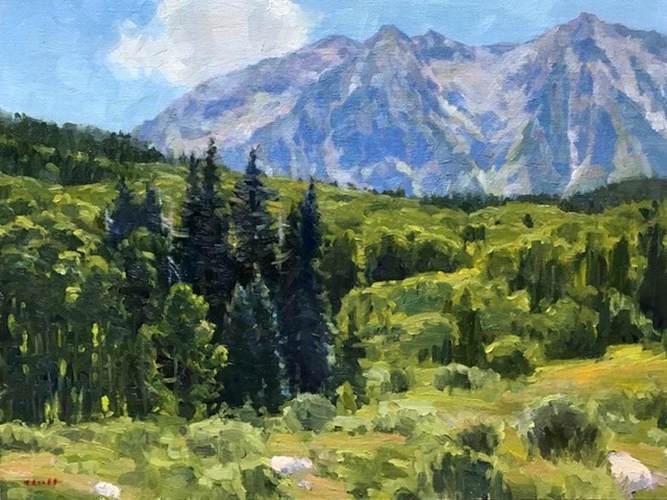 In 1990, I got interested in Plein Air painting because I wanted to be outside, out of the studio, where I could study nature and all she has to offer. 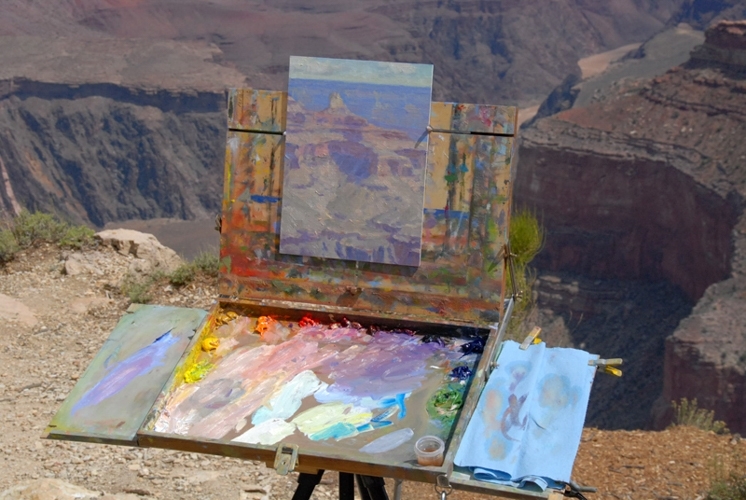 Plein Air painting was started by impressionists in the 1880s in France. They would go out in the field and paint on location. Camping gets me into nature. I can paint a landscape, study trees, wildflowers, birds and animals up close. 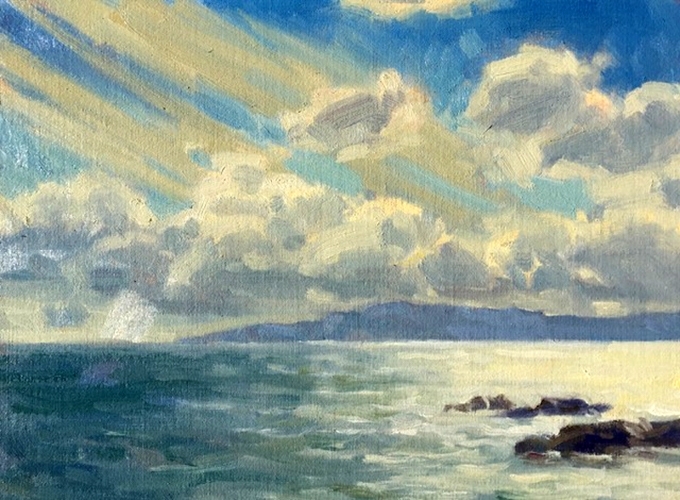 With Plein Air painting, you have to be quick because the light changes so fast. It’s good to start from nature with color notes and ideas. My paintings are finished on location or in the studio and turned into something larger. It’s the larger paintings that are the important ones. That’s what gives me my income. TCM: How many paintings do you produce a year? Gregory: It used to be a lot more a year. Some shows needed thirty paintings. At that point I was maybe doing 60 a year. I sometimes get into a dry spell and then I’ll get creative and do a whole bunch. One trip may give me a lot. Right now I do at least fifty paintings a year. TCM: How long does it take you to do one painting? Gregory: For light, two to three hours is my window of opportunity. Three hours later and it’s not the same scene you saw in the beginning. It’s quick. Sunsets and sunrises go so fast. Early morning and early evening has the best light and is the most fleeting. You train yourself to be quick. TCM: How often do you go truck camping to paint? Gregory: It’s seasonal. I don’t go to the mountains in the winter, but I go in the summer when the wild flowers are blooming. I get better weather and I’m out of the heat. In the winter, I go to the California coast. It’s temperature controlled. The Grand Canyon can be comfortable in the winter. I’m a fair weather camper. I don’t like to be cold. If the temperatures are not comfortable or if there is wind, I bail. I try to go out and paint once a month in my camper. 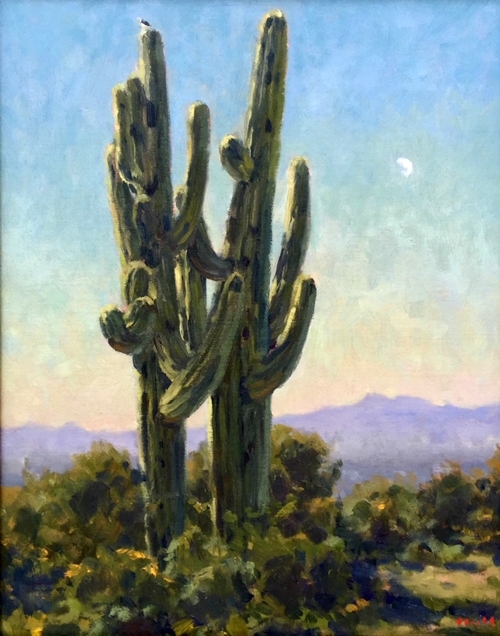 I have a studio at home, and just bought a new house in Mesa, Arizona a couple years ago. It gets to 120 degrees in Mesa during the summer. Thankfully, I have a pool, and there are good mountain spots close to home where it’s 40 degrees cooler. My ideal length of stay for a painting trip is ten days. Then, home calls me back. 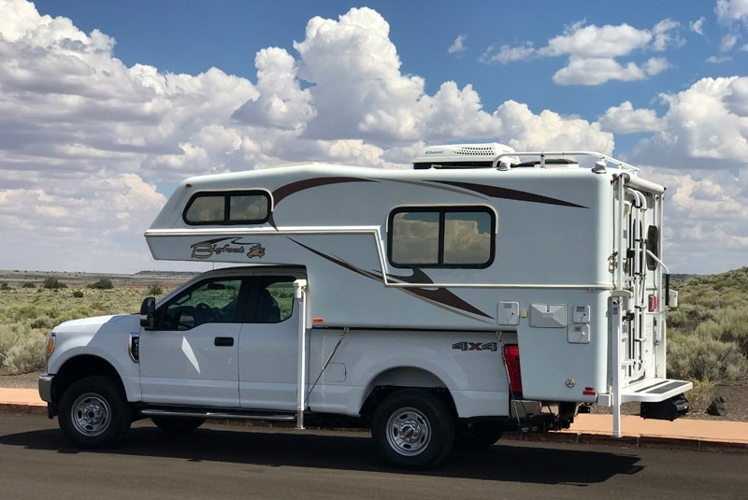 As soon as I’m home for a while digesting what I did on the trip, I start getting antsy for that truck camper freedom again. TCM: Do you enjoy anything else during your truck camping trips, or are they completely focused on painting? Gregory: I like to cook in my camper, which saves money. 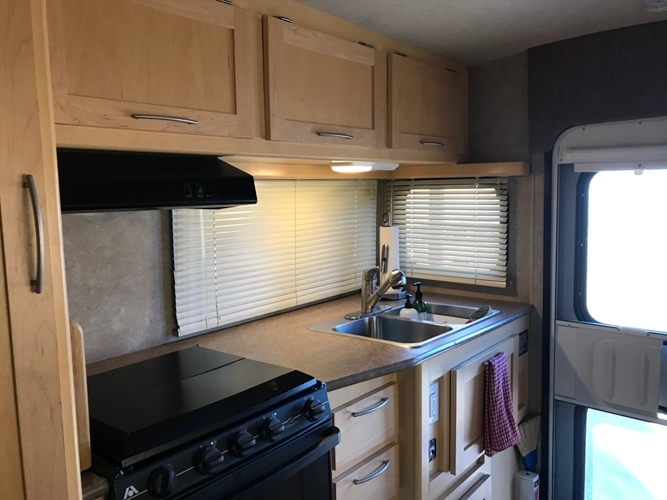 My current Bigfoot has a great kitchen and prep area. A lot of gourmet treats have been created there, including baking croissants in the oven! It’s a healthy lifestyle cooking your own food. I am always searching for something to paint, so they all turn into painting trips. It’s a good excuse to spend a night in the camper. TCM: Have you modified your camper in any way for your painting requirements? Gregory: I usually work at the dinette table. Dinette tables are usually too high, too wobbly or the wrong shape. 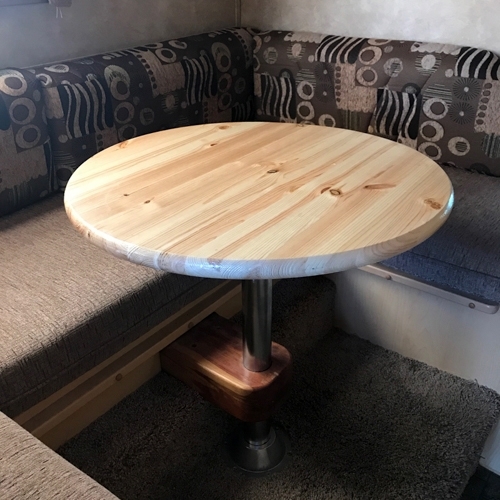 My latest mod is a 24-inch circle table. There is room for two to eat or compute with plenty of lounging room. In my previous rigs, I modified the fold-down bunk over the dinette to hold storage boxes for my paintings. I could slide the wet paintings into the racks like pizzas and close off the paint fumes. Now I don’t want the fumes in the place I sleep, so I moved the storage boxes to the back of my truck. I also have a backpack for all my painting supplies. Everything fits in there. 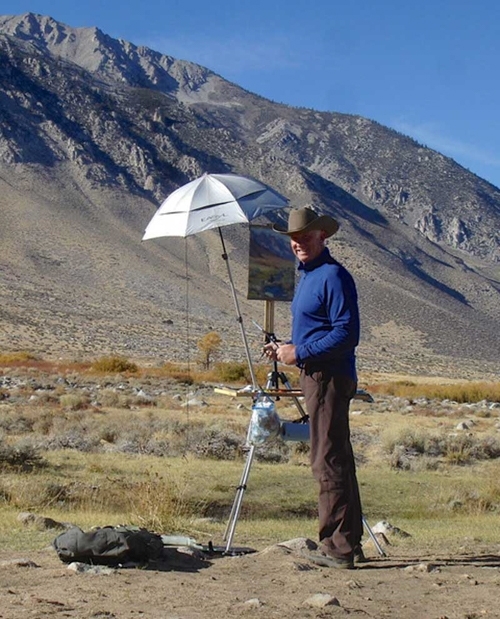 I can walk a couple of miles to my spot and set up my umbrella, easel, and canvas. I’ve tried to keep the backpack as light as possible. TCM: Since you’re always in search of great scenery to paint, are there any places that you would recommend to fellow truck campers? Gregory: I love the roads that get me away from other campers. I enjoy campgrounds with hookups at times, but I prefer to get off-road and dry camp. 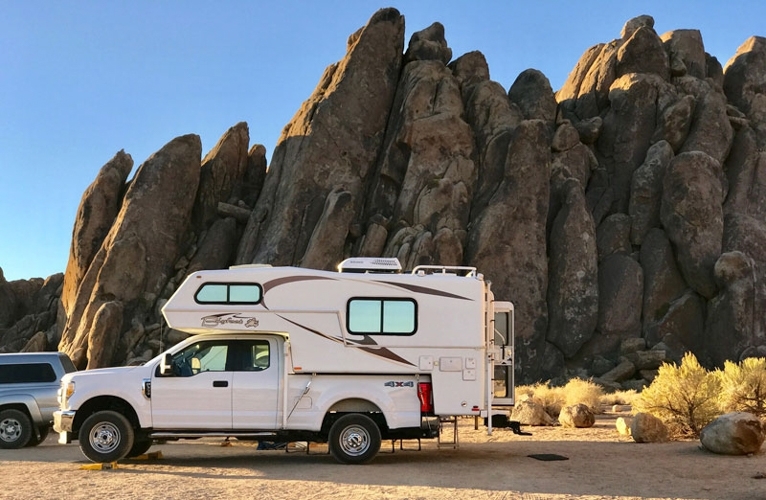 Some beautiful spots I recommend are the dirt roads outside of Crested Butte, Colorado, the boulders up on the mountain outside of Bishop, California, and Alabama Hills near Lone Pine, California. All of those camping spots are free. Outside of Bishop, head up on the road to Lake Sabrina and cut-off on the dirt road that goes to the Buttermilk boulders. I’ve found cool camp spots there. It’s a terrible road that you wouldn’t want to take a trailer down. 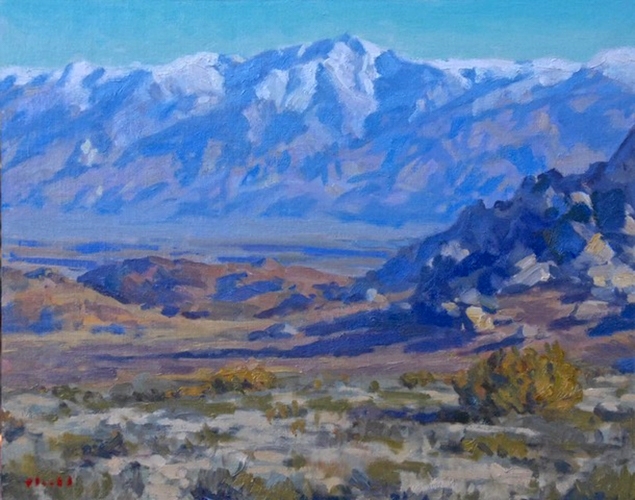 Once you get past the boulders, you have beautiful views of Owens Valley and the Sierra Nevada range. TCM: We couldn’t agree more about Alabama Hills and will add your other suggestions to our list. I saw quite a few pictures of the Grand Canyon, including one that was labeled “secret spot”. Any pointers for that area? Gregory: Usually a national park is surrounded by national forest. That’s the trick of the Grand Canyon; Kaibab National Forest. 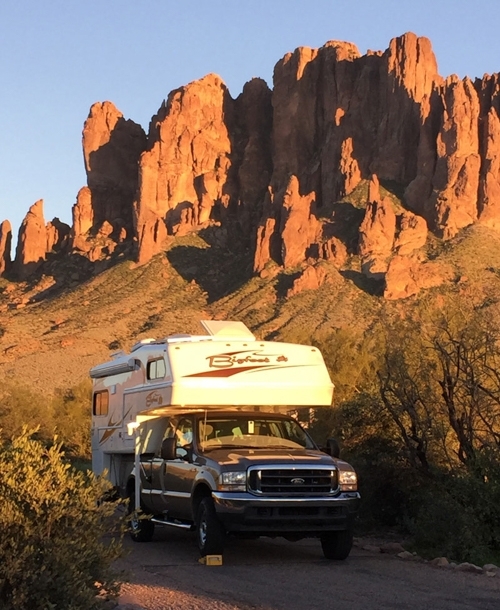 You can camp anywhere in national forest, so you don’t have to stay in the campground. Get off the main road and camp under some trees. That’s the beauty of the truck camper. You can’t do that with larger vehicles. All I can say is that this secret spot is near the Grandview overlook. The South Rim features the classic beautiful colors and great scenery. 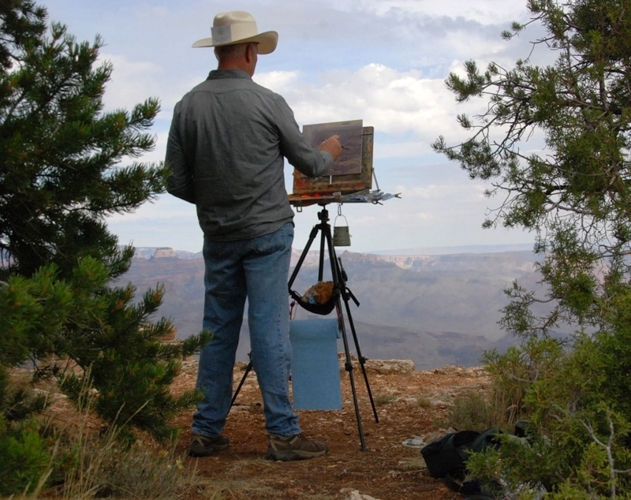 The North Rim is different as far as painting goes. I’d rather paint the South Rim, but there are tourists. I have found a few spots that are private. I can paint with a crowd, but it gets annoying when people are talking all the time. You can drive to Diamond Creek where they unload the boats. It’s on the Hualapai reservation, so you have to go through Peach Springs. I recommend seeing that. On the east entrance at Desert View there are spots outside the park where you can see a little of the Little Colorado River Gorge. At Lee’s Ferry there’s a campground by the river. It’s below the Glen Canyon Dam. That’s where the river trips start. TCM: Tell us about the book Amy Abrams published about you and your work. Gregory: Amy Abrams wrote an article in Arizona Highways about ten years ago. She’s a good writer. They are hard to find nowadays. Where has English gone? I contacted Amy about writing a book about my career as an artist. She had just put together another artist’s book and knew the process. She came out and stayed for three days to interview me. She also got the images she needed to write and produce the book. Everyone has a story worthy of telling. I’ve had a good life as a painter. TCM: What are your truck camping plans for the future? Gregory: I want to continue what I do, which is exploring and painting the world. I would like to do an Alaska trip in the future, but I’m really in love with the western United States where I grew up. There’s still so much more to explore. 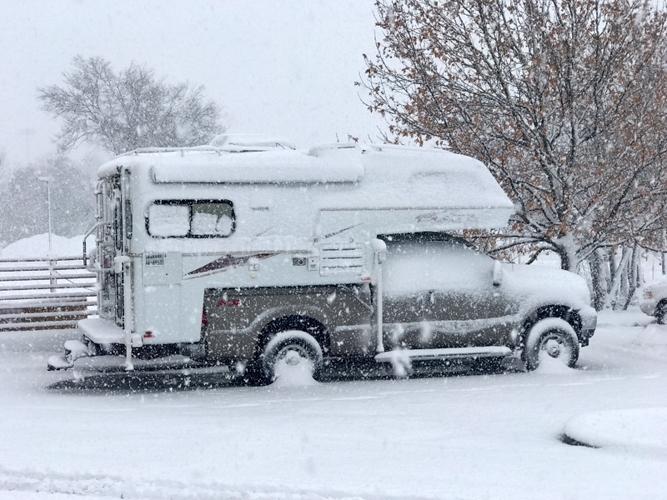 I just love the freedom that my truck camper gives me. I’ve been lucky to incorporate the camper lifestyle into my work and I have been able to get to beautiful spots off the beaten path. I love it!